When it comes to the highest quality quartz stone worktops, you are going to want to lead with an affordable, reliable specialist who offers a wide variety of quartz worktops colours and finishes. The team at Pure Quartz will always be happy to be on hand to supply you with all the advice and guidance you need. From black or white quartz countertops to grey quartz worktops and more besides, allow us to show you around our fabulous collection of quartz worktops colours and styles. There’s nothing quite like quartz composite worktops – or why not a simple, yet luxury look with black quartz worktops or white quartz worktops? Supported by the likes of Compac, Silestone, Lunastone, Samsung and Arenastone. Our quartz worktop prices are affordable as much as they are reliable and gorgeous to look at – an asset for kitchens, offices and bathrooms looking for that certain quality look and finish. Grey quartz countertops hold their own, too. Our professional and trusted experts will be able to oversee the idea process, designs, fittings and all bespoke or custom needs you require in setting up the ideal quartz look for your home. Buy luxury quartz stone worktops and granite quartz worktops from our top team and you’ll receive a stunning installation and all the aftercare you could ever need with Quartz Care on demand. For a natural look in grey or blue, call upon our team to find the best-looking brown quartz worktops and grey quartz worktops across Lambeth and South East London, UK. Our specialists and expert installers trade in Unistone, Istone, Classic Quartz, Santmargerita and much more. When it comes to getting the perfect quartz stone worktops and granite quartz worktops looking perfect for each and every one of our customers. Don’t ever worry about the cost of quartz worktops – whether for bathroom or kitchen – as our low cost tariff will ensure that your household budget always has room to breathe. Never pay us until you are completely satisfied – it is all part of our fantastic deal. Quartz worktops prices are available on request at any time, though we will make sure to let you know of any and all applicable quotes and prices as we progress through the design and installation process. Engineered quartz worktops and sparkle quartz worktops look especially fabulous in all lights – all while you may worry that cheap quartz worktops means lesser quality. 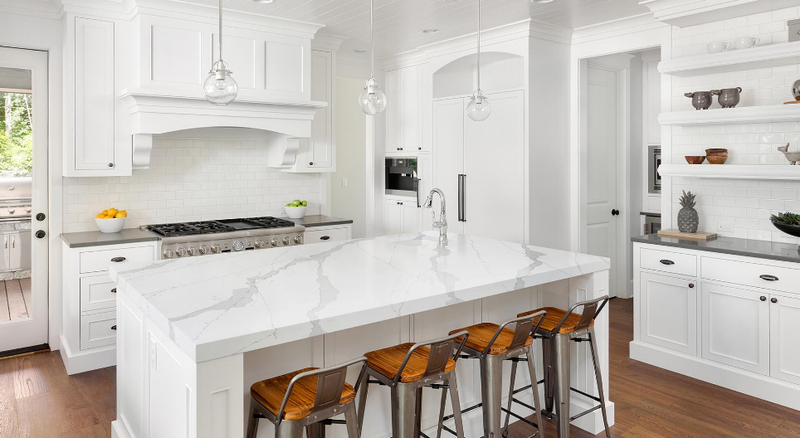 You can rest assured that our focus is just as firmly on offering you the best possible marble quartz worktops and more for an incredibly low cost. Installing is simple and hassle-free – whether you’re opting for black quartz worktops, white quartz worktops or grey quartz worktops, we’re here to make sure you are always happy with the design decisions made. Looking for high quality quartz worktops near me? Interested in affordable fitting and installing in the Bromley area? Call Pure Quartz today on 01233 733111 and email us to let us set you up with a reliable, low cost quote and Creative Solutions.